The trail cameras prove they’re there, but this week I failed to lay eyes on any of the mature bucks that visited my Moultree cams throughout the summer and fall. The calendar tells us it’s getting to be that time of year, but the deer haven’t yet cooperated. That will soon change. 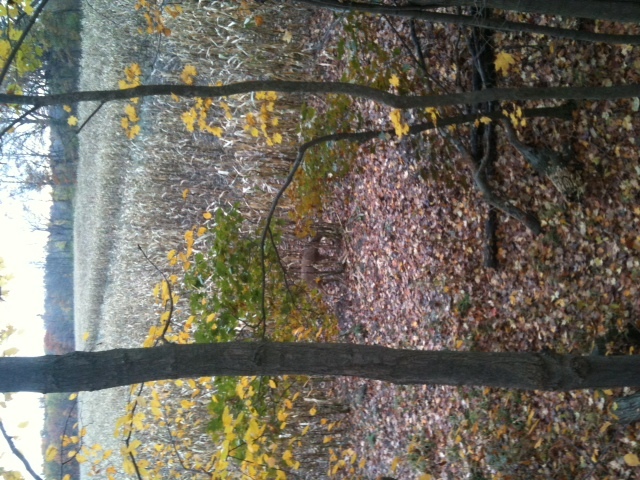 A doe feeds on corn Saturday morning. I expect activity to increase this coming weekend and really get rocking the week of Nov. 7th. My hunts this week were fairly uneventful, although I saw plenty of does and yearlings. The most action I saw was last Thursday morning when a 1.5-year-old 8-point bumped several does past my stand. With a week and a half of vacation time coming up this week and next, I’m confident that I can get on some mature deer. I’ll certainly be trying. I’ve got my Dad in the field along with another hunting buddy, so hopefully between the three of us we’ll get our hands wrapped around some bone at some point during the next few weeks. This entry was posted on Saturday, October 29th, 2011 at 7:10 pm	and posted in 2011, Day Afield, Day Afield, General Tales, General Tales, Uncategorized. You can follow any responses to this entry through the RSS 2.0 feed.